It's best to think of Samsung's CES keynote as a sort of State of the Union. The company made a few interesting announcements, but most of the 45-minute presentation was spent reflecting on the past and hinting at the future. Swallowed whole Samsung seems to have one clear message: 2015 was big but 2016 will be even bigger. Samsung Pay launched this year in two countries for a handful of Galaxy devices. Despite those initial constraints the company claims that "the early success of Samsung Pay is clear." Later this year the Gear S2 smartwatch will gain mobile payment support. We also learned that the service is expanding to Australia, Singapore and Brazil, along with previously announced plans to hit the U.K., Spain and China. Samsung leapfrogged its IoT competition when it acquired SmartThings in 2014. Today the smart home platform works with 200 different devices, and it even comes integrated into Samsung's new TVs thanks to a special USB stick. The company also introduced a SmartThings starter kit earlier this year, and you can expect even more connected gadgets in 2016. This is CES so of course there are new TVs. The company already owns 50 percent of the 4K TV market, and it's poised to do even better in 2016. Samsung unveiled the first bezel-less curved television, and teased plans for the world's largest SUHD TV, an 8K TV and a new transforming TV. A new sound bar with Dolby Atmos speakers (typically used in movie theaters) and a Blu-Ray player with UHD resolution support are in the pipeline as well. The company also revealed its latest smart TV software, which promises seamless access to pretty much anything you can think of. The user interface now groups inputs (like a gaming console) and streaming apps together. You can even hover over an app to quickly generate a few interesting options without ever leaving the main menu. In 2015 the Gear VR hit the market, bringing high-quality virtual reality to the masses. "In less than a year we took virtual reality from a novel concept to widespread adoption with the Gear VR," boasted Alanna Cotton, Samsung's American marketing VP. The company already offers over 400 movies through its own Milk VR portal, with more coming soon. Maybe we'll even see a headset that works with non-Samsung phones. 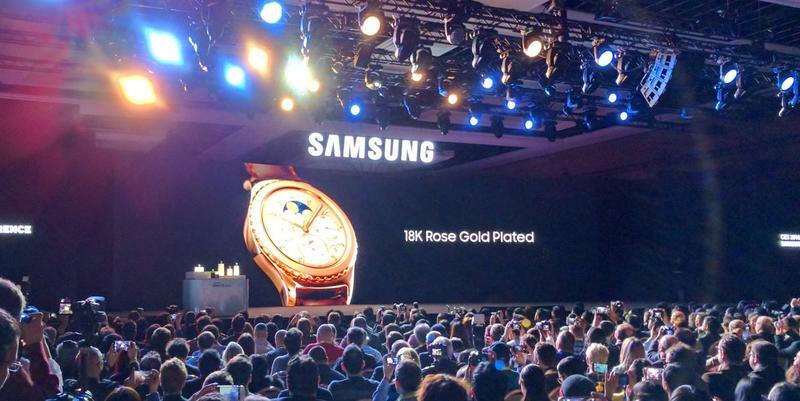 Samsung announced new color options for the Gear S2 and plans for iOS compatibility. The company also revealed a range of watch faces based on famous art ranging from work by Keith Haring to Peanuts cartoon characters like Snoopy. For now Samsung seems happy simply tweaking the Gear S2, but you can probably expect a sequel sometime this year. We already gave you an in-depth look at the Galaxy TabPro S, Samsung's powerful new Windows 10 convertible tablet. It's interesting to see the company slap the Galaxy brand onto a Windows device instead of Android, and it's possible that when it comes to future tablets Samsung may decide to lean even more on Microsoft software instead of Google's. Samsung's bringing a ton of new technology to its already high-tech fridges. The latest model includes a large touchscreen display where you can post reminders for the entire house, share family photos and even grocery shop thanks to a new partnership with MasterCard. Samsung is a big company, and it's only getting bigger in 2016. You can expect juicier announcements throughout the year, but the state of Samsung's union already looks good.